Sonex Aircraft is announcing a collaboration with High Performance Aircraft Group to showcase the SubSonex Personal Jet. 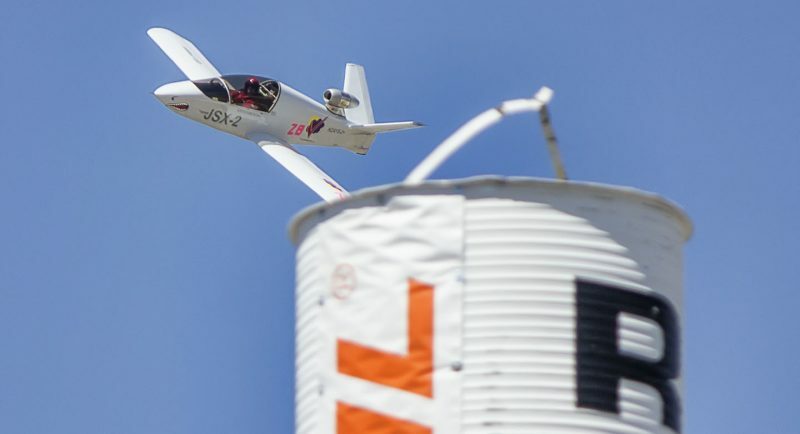 High Performance Aircraft Group debuted the SubSonex at this year’s Pylon Racing Seminar (also known as “Rookie School”) last week, June 7-10 at Reno Stead airport in preparation and training for the National Championship Air Races in September. The SubSonex was taken through various flight scenarios by three-time Reno Gold champion Pete Zaccagnino and exceeded performance expectations. During the four-day event, the SubSonex participated in formation flights with as many different aircraft as time allowed. This included fingertip, echelon, cross-unders, pitch out rejoins and recoveries. Due to runway construction at Stead airport, only Saturday and Sunday were available for track time during this year’s PRS. Very high winds prevented all flights on Saturday, so all time on the track had to be accomplished on Sunday. “I did three flights on the track and everyone loved the SubSonex,” writes Pete, “First time in history for this jet design to make flights on the Reno race course!” Flights during PRS were conducted on the Jet/Unlimited course, however, Sonex Aircraft and High Performance Aircraft Group are hoping to gain approval for future testing and exhibition racing on the shorter courses, designed for aircraft closer to the SubSonex’s speed envelope and level of maneuverability. High Performance Aircraft Group will showcase the SubSonex Personal Jet at a variety of aviation events throughout the season, to be announced. The jet has earned a top-level endorsement from Pete Zaccagnino and equally impressive accolades from attendees at the year’s Rookie School – a true testament to the design and craftsmanship of the SubSonex aircraft. Zaccagnino is flying SubSonex model JSX-2 factory prototype number 2, also known at the Sonex factory as “Sharkie,” for these racing and demonstration flights while JSX-2 factory prototype number 1 is on the airshow circuit for its third season performing day and night pyro aerobatic air shows around the nation by Bob Carlton of Vertigo Airshows. The SubSonex Personal Jet is offered to Sonex Aircraft customers as a Quick Build aircraft kit and is powered by the PBS TJ-100 turbojet engine. The airframe kit plus engine price is under $100,000 and complete costs to purchase and complete a SubSonex kit start at only $108,000 – for a JET! High Performance Aircraft Group, based in Park City, UT is headed by aeronautical engineer and 3-time world champion race pilot Peter Zaccagnino. Pete has flown throughout the world and performed specialized flight testing for various aircraft manufacturers in both civilian and military aircraft. He has over 22,000 flight hours in hundreds of aircraft types. High Performance Aircraft Group specializes in flight testing, high performance aircraft training, global aircraft placement, aircraft management and acquisition. Pete will be racing in this year’s National Championship Air Races in the Jet Class and Sport Class. We expect championships in both!